Set along the rugged and colorful scenery of the Mississippi, St. Croix and Vermillion Rivers, Hastings is a river town steeped in tradition. With a rich heritage of progress, Hastings has grown to meet the needs of its population without forgetting its past. This certainly rings true for how the community has handled its water treatment system. Hastings is fortunate to have a plentiful groundwater source capable of supplying the community of over 22,000 residents with adequate water capacity. The groundwater quality is pristine with very little iron and manganese – below secondary standard levels. However, Hastings is located in a highly agricultural area, and over time, the nitrate concentration in several of its wells has increased to levels near the EPA mandated MCL of 8 mg/l. To remain in compliance, the town made the decision to construct a new water treatment plant for nitrate removal, the first of its kind in Minnesota. 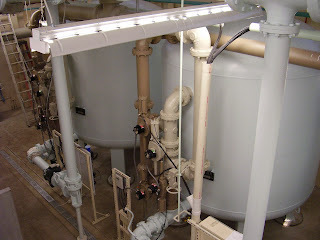 Working closely with the consulting engineer throughout the design phase of the project, Tonka supplied the entire anion exchange treatment system including: anion exchange vessels, valves, facepiping, instrumentation, brinemaker, brine delivery components, control system methodology, and a softening system for brine make-up water to prevent calcium sulfate precipitation. The plant utilizes four anion exchange vessels, each rated to treat up to 400 gpm. A portion of the 2400 gpm total plant flow is treated through the units while the balance is bypassed around the anion exchange vessels and blended with the treated water to produce a consistent finished water with nitrate concentration below the EPA’s MCL of 8 mg/l. The bypass/blend allows the town to remain in compliance today, as well as having the flexibility to adjust the treated/bypassed proportion for future compliance, should the raw water nitrate level continue to increase.